Baccarat is one of the most popular games in the world, the most fair entertainment project. It is a guess game with playing cards. 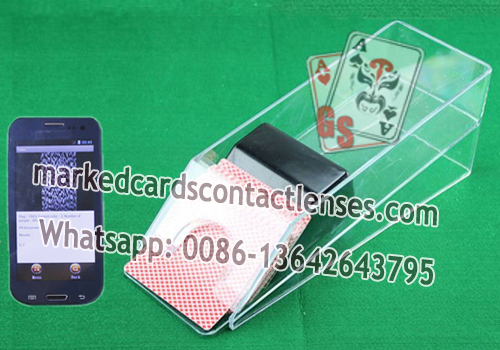 Baccarat is a card game dealt from a shoe that holds 6 or 8 decks of cards. Two hands are dealt by the house dealer, the "banker" hand and the "player" hand. Before the hands are dealt, bets may be placed on the banker hand, on the player hand, or on a tie. People just guess who wins with the points, the banker or the player? There is a scanning system that can work well for Baccarat game. The poker analyzer can help you to cheat at Baccarat with marked barcode cards. It will tell you if it’s the "Banker" or the "Player" wins or just a "Tie". You can just hear the result with the spy earpiece and enjoy the game. And also you can use a remote control to press to hear the next hand, only one time scan then you will know the next or next hands. You can just make a wise bet after you get information of the following hands.